Anastatica, mostly known as rose of Jericho, is a monotypic genus with the type species Anastatica hierochuntica. The genus is a member of the family Brassicaceae (formerly Cruciferae), in the division Magnoliophyta of the class Magnoliopsida. The plant is a small gray annual herb that rarely grows above 15 centimetres (6 in) high, and bears minute white flowers. It is a tumbleweed and a resurrection plant. 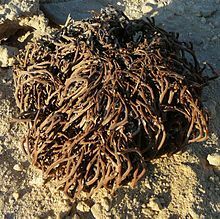 This species is not to be confused with Selaginella lepidophylla, sometimes wrongly referred to as "rose of Jericho", or rightly "false rose of Jericho". Common names include, Jericho rose, true rose of Jericho, Maryam's flower, flower of St Mary, St. Mary's flower, Mary's flower, and white mustard flower. About the name "rose of Jericho", the 16th century herbalist John Gerard is said to have remarked, "the coiner of the name spoiled it in the mint; for of all plants that have been written of not any are more unlike unto the rose." Anastatica is found in arid areas in the Middle East and the Sahara Desert, including parts of North Africa and regions of Iran, Egypt, Palestine, Israel, Syria, Iraq, Jordan, and Pakistan. A plant with great resistance to desiccation, its branches have the property of contracting with dryness, remaining closed and dry for many years, reopening with moisture or contact with water, regaining all its freshness and beauty. After the rainy season, the plant dries up, dropping leaves and curling branches into a tight ball, and "hibernates". Within the ball, the fruits remain attached and closed, protecting the seeds and preventing them from being dispersed prematurely. The seeds are very hardy and can remain dormant for years. Moistened again in a later rainy season, the ball uncurls and the plant wakes up from its dormant state, which causes the capsular fruits to open to disperse the seeds. If water is sufficient, the dispersed seeds germinate within hours. After it curls, it is easy for the wind itself to lift and drag it large distances, making them obligatory travellers through steppes and deserts crossing the borders of various countries in Asia and disseminating their seeds for all of them. A fraction of the seeds are dispersed in the vicinity of the parent plant by raindrops hitting a spoon-like appendix on the seeds. The seeds have a sticky coat that helps them adhere to the soil, but they also may be carried downstream by surface wash. However, seeds swept downstream do not survive. The process of curling and uncurling is completely reversible and can be repeated many times. The ability of the plant to do this is attributed to the presence of trehalose, a disaccharide sugar involved in several mechanisms of cryptobiosis. Although the rehydrated plant sometimes is described as putting out new leaves, flowers, and fruits, this is disputed; instead, the seeds may sometimes germinate and sprout new plants while still seated in the fruit on the dead parent plant. Anastatica has been described as the most famous tumble weed. Once dry, the ball is said to become detached and is dispersed by wind. This tumbleweed habit has been interpreted as a mechanism of avoiding burial in dunes. However, Anastatica may possess this habit only in the literature, or tumble only rarely, if uprooted by accident. Since ancient times it was used as an element to guess the climate, since being a vegetable hygrometer, the wise man or shaman, predicted it with success. In dry weather the plant remains completely closed; in wet weather, it opens slowly; if it threatens rain, it opens in a very showy way and with more or less speed according to the proximity of discharge of the clouds. This plant was shown in BBC's Africa's fifth episode. ^ Quisquis (1886). "Tumble-weeds". Botanical Gazette. 11: 68. doi:10.1086/325923. ^ Friedman, Jacob; Zipporah Stein (March 1980). "The Influence of Seed-Dispersal Mechanisms on the Dispersion of Anastatica Hierochuntica (Cruciferae) in the Negev Desert, Israel". The Journal of Ecology. 68 (1): 43–50. doi:10.2307/2259242. JSTOR 2259242. ^ L. J. Templin (1890). "Distribution of plants". The Kansas City Review of Science and Industry. 3: 612–614. This page was last edited on 18 December 2018, at 13:00 (UTC).